Have you ever been using a MERGE statement and when you get the MATCHED clause you think to yourself, “This is easy, I’ll just script out an UPDATE statement and do a quick replace”? Only when you get around to it doing the quick replace it isn’t so quick. A friend of mine(SB) once said “I work hard at working smart”. It is a great motto to work by especially when working in a technical role. So in the spirit of this motto, I decided to find a smarter way to do a quick replace for a MERGE statement’s MATCHED clause. I’ve been using regular expressions for a long time, but I recently discovered a little known feature called replacement expressions. Basically, it allows the replace to use a portion of what it found and put it back. This is great news! 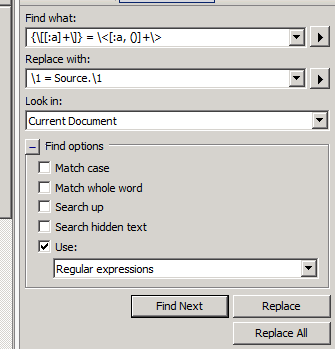 I run my replace all and I instantly have the columns with the syntax I need. I hope this comes in handy for you; I know it sure came in handy for me.